Vitolo has completed his move to Atletico Madrid, despite signing a new contract with Sevilla last week. Similar to Sevilla, Atletico also announced the signing on their official Twitter account. The caveat here is Vitolo actually signed the contract. In their tweet, they mention that Vitolo will be registered as an Atleti player on January 1st. For those wondering why Atletico Madrid are serving their transfer ban for breaking FIFA rules with regards to signing minors. In their press release, Atletico mentions that Vitolo will play the first half of the season with UD Las Palmas. Vitolo rescinded his contract with Sevilla after his €37.5 million release clause was paid, thus making him a free agent. In effect, he’s signing a six-month deal with Las Palmas. It’s a strange situation triggered by Atletico’s transfer ban but appears to be one agreed to by the rojiblancos and Las Palmas. 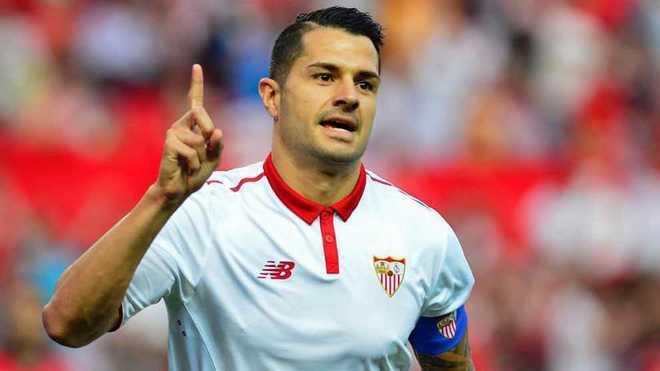 The deal sees Vitolo signing a five-year deal ending in 2022. He will be earning €8 million a season making him the second-highest paid player only behind Antoine Griezmann. To put it in perspective, he was earning €3 million with Sevilla last season and had he accepted their renewal, it would have increased to €5 million. Sevilla is still contemplating whether they will take any legal action either against the player, Atletico Madrid, or both. The club has to feel a bit embarrassed after their president came out to announce Vitolo’s renewal and their official account tweeting out the news. In the end, El Cholo Simeone, and Atleti got their man.